"If we are being overcome at 6th and Pike, I want you to drench them"
By 3PM, the belated attempt by police to push the protesters away from the triangle of key intersections surrounding the Convention Center was in full motion. The Direct Action Network blockade was still intact, immobilizing the police and preventing movement through the strategic triangle northeast of the AFL-CIO parade route and the downtown shopping district. As a result, most of the police action took place south and west of the Convention Center. Starting from the south along Union and University Streets, the police moved north along Third to Seventh Avenue to sweep the demonstrators north into the route along which the parade had retreated. The police sweep northwards compressed the crowds into the east-west corridor running along Pike and Pine Streets. Here, the police again stalled against the large size of the crowds. Recently released police radio tapes capture the frustration of the police. "We're losing it at 6th and Pike. We're losing it just south of 6th and Pike," one officer reported as the police tried to push north on 6th Avenue. The main lines of protester resistance ran east-west along Pike and Pine Streets and the police were repeately balked by the protest lines running at right angles to their attempts to push protesters north along the route the labor parade had withdrawn along. "Shoot as much gas as you want in there now," came the response from Capt. Jim Pugel, who commanded the force in the streets during the WTO. "If we are being overcome at 6th and Pike, I want you to drench them." The compression halted the police movement for several hours, as dumpsters which had been pushed into the streets to block the center of intersections began to burn. These bonfires slowly spread in an irregular way as the crowds withdrew west, not north as the police wished, and moved up into Capitol Hill in the early evening. The Mayor's declaration of civil emergency at 3:25PM set in motion the reinforcements from the King County Sheriff's Department, the Washington State Patrol, and local police departments from surrounding cities and towns. The arrival of the reinforcements in the streets occurred relatively slowly over the next three hours, impeded by the discord which dominated the relations between the Seattle Police and the King County Sheriff Dave Reichert. By 5:30PM, the police lines -- now increased by the arrival of Sheriff's deputies -- had reached the corner of Fourth and Pike. The protesters began withdrawing west along Pike and Pine Streets, towards Capitol Hill, followed by police firing tear gas, rubber and wooden projectiles, and accompanied in some instances by vehicles. The police for the most part, did not maintain close contact with the crowds and followed them, rather than drove them, across the freeway overpasses and into Capitol Hill. The turning movement of the police -- from a northern push to an eastern one -- was not according to the plan outlined by Assistant Chief Ed Joiner. According to political researcher Daniel Junas, the Direct Action Network overheard police radio messages in which units in the East Precinct on Capitol Hill frantically demanded that the police downtown cease pushing demonstrators up the hill. The central command replied that they were pushing the crowds north (i.e. along the route of the AFL-CIO retreat from downtown) not east. The loose contact between police and demonstrators permitted the last act of serious vandalism of the day. Police were not controlling the intersection at Sixth Avenue and Stewart Street, near the Westin Hotel. Protesters had built a bonfire in the center of the intersection. At approximately 7:15PM, a group of vandals smashed the window of the Starbucks coffee shop. This was the same coffee shop from which Washington State Patrol Chief Annette Sandberg saw the Direct Action Network affinity groups at 5:30AM, as they moved into position and seized the strategic intersections surrounding the WTO conference site. Events had come full circle. As in the morning, the police presence was not visible to the protesters, although the evening response was quicker. Prosecutors allege that Danny Babcock and an unidentified accomplice took a USA Today vending machine and hurled it through a window of the Starbucks store "Defendant Babcock then kicked and pulled away the glass from the window, enabling others to enter and destroy the inside of the Starbucks," according to a police report. "Babcock entered the store and was arrested as he emerged from the crowd carrying several bags of coffee from the display inside of the store," the report said. The criminal complaint against Babcock states that he handed a 1-pound bag of coffee to a police detective outside the store. Of the four people arrested at the coffee shop and charged with felonies, none were "Anarchists from Eugene." One was from Seattle, two appear to be from Portland (although they gave the address of a Seattle homeless shelter) and Babcock's residence is not disclosed in news reports. The process of the protesters' withdrawal from downtown coincided with the arrival of additional police reinforcements, the declaration of a 7PM curfew and the fall of darkness. The WTO had announced the cancellation of activities around 1PM, although word of the cancellation did not become widespread until late afternoon. Based on the videos and photographs of the move up Pine Street, the protesters appear to have decided to leave downtown and were followed -- not "swept" -- by police. The police decision to follow up the hill, firing tear gas and rubber bullets, is inexplicable in terms of clearing downtown. Of all the police actions during Tuesday, only the initial deployment of tear gas at 6th and University and the pursuit up Capitol Hill suggest a breakdown in command. The police decision not to disengage continued the disturbance late into the night. The clashes with police at the top of Capitol Hill were echoes of Tuesday's daylong "Battle in Seattle." With the departure of the AFL-CIO parade participants, the Direct Action Network assumed total control of the protests in Seattle. With their one brief appearance, the Black Bloc presence in the streets subsided, effectively now under the control of the DAN non-violence strategy. The media, however, directed considerable attention to the Eugene contingent. The media coup for the Black Bloc created an unprecedented amount of attention for the philosophy of "autonomist" anarchism and John Zerzan, a Eugene anarchist philosopher who promotes "primitivism" and a withdrawal from technological society. 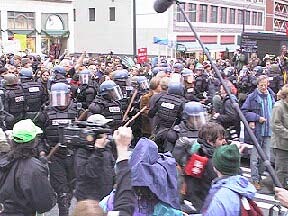 The Direct Action Network strategy of non-violent civil disobedience clearly had succeeded against the Black Bloc's efforts to escalate the police violence, the AFL-CIO's strategy of controlling and marginalizing protests in favor of a symbolic parade, the attempts of the Seattle police to clear the streets with tear gas and the media effort to frame the issue in terms of "violent protesters." Mayor Schell's declaration of civil emergency dramatically altered the police strategy for suppressing the protests. As the hard-liners inside and outside the Seattle Police Department had wished, law enforcement was now prepared. For the entire month of December, the wail went up from law enforcement "we weren't prepared." On Wednesday, the police were prepared with more troops, more gas, more barricades and a declaration of civil emergency complete with a "no protest zone" enclosing downtown, a curfew and the suspension of civil liberties. The AFL-CIO parade was over and done with and the "day-trip" protesters who rode to town on union busses were gone. The conditions on Wednesday were far more favorable to the police than anything which could possibly have been arranged on Tuesday. Assistant Chief Joiner said Seattle police and their law enforcement partners initially looked hard at a plan based on preparations for the NATO conference in Washington, D.C. This plan was similar to the strategy which was put in place after the declaration of civil emergency: "We considered it and basically rejected it as something that, in a perfect world, we'd like to do, but in a real world is a less viable option. Can you imagine me going to the mayor, the governor, before the conference even happened, and saying 'I need to create this security perimeter from Seneca to Lenora Streets, from Fourth Avenue to the freeway, and I need to shut all the businesses down for five days the week after Thanksgiving?' Can you imagine the kind of response I'd get, besides asking me for my resignation then?" "It was impossible," Joiner said. "Politically it was impossible. The damage to the downtown business core would have been substantial." Once again, the Direct Action Network prevailed. The victory on Tuesday was reaffirmed Wednesday. And the Seattle Police concerns about bringing outside law enforcement into the city were realized in full that night when police rioted on Capitol Hill.